Reenact the epic final duel between Luke Skywalker, Darth Vader and Emperor Palpatine from the movie Star Wars: Episode VI Return of the Jedi. 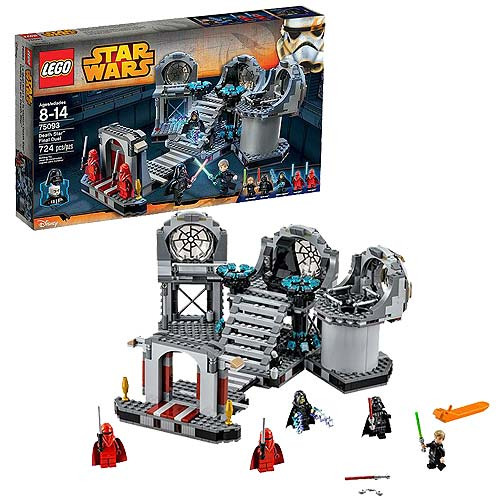 This amazing LEGO Star Wars recreation of Emperor Palpatine’s throne room aboard the second Death Star features loads of great play details, like swing-out side sections for easy play, opening entrance doors, Force Jump function, collapsing stairs and bridge, reactor shaft, and detachable throne section with rotating throne and hidden Lightsaber pop-up function. Can Luke overpower the Royal Guards? Will Lord Vader rescue his son from Palpatine’s deadly Force Lightning attack and send the evil Sith Lord tumbling down the reactor shaft? Only you can decide! Includes 5 mini-figures with assorted weapons: Luke Skywalker, Darth Vader, Emperor Palpatine and 2 Royal Guards. Ages 8 - 14.